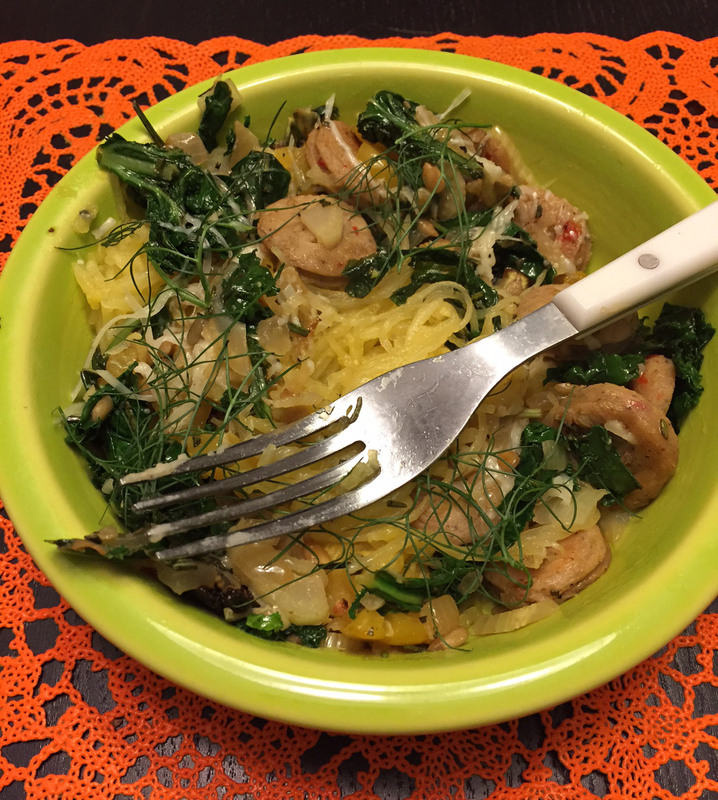 spaghetti squash | real food. home made. Halve and de-seed your spaghetti squash. Brush with EVOO and season with salt and pepper. Bake, cut side up, for 1 hour. Meanwhile, dice up your onion, pepper, and thinly slice an equal amount of fennel. Reserve the herby tops in a small bowl for serving. Mince your garlic and rosemary, and put them aside in a separate bowl. Heat some EVOO on medium heat in a large pan, and sautée the onion, pepper and fennel bulb pieces. When they are softened, add in the garlic, rosemary and kale, and cook until fragrant and kale is wilted. Remove this mixture from the pan, and place in a large bowl. Squeeze one half of the lemon on top, and add your sunflower seeds. In the same pan, add a bit more EVOO and cook your sausage coins. Add these to the bowl once browned. When the squash is done, use 2 forks to pull it apart. Squeeze the second half of the lemon on top, and then incorporate into the rest of the ingredients. To serve, scoop mixture into bowls, and add parmesan cheese and fennel herby tops.